I had seen these advertised on television and thought it sounded like a really good idea. I had just not got around to purchasing one, so when I was offered this review, I was really excited to be able to give it a go. The new stainless steel like one is really good and I think you would be able to fit it in with any kitchen decor if that's the sort of thing that bothers you when buying something (me not so much - I care more about usefulness and functionality than the colour!). It's great idea when you think about it. Most people don't even think about the germs all around them. They can't see them, so they don't worry - but think how many bouts of colds & flu or food related illness could be avoided if everyone just took a little more and cleaned their hands when they got home, washed their hands before eating, washed their hands after handling raw food and so on. The thing is, you often put all of those germs onto your soap pump and the next time you use it, those germs are all still waiting there for you. 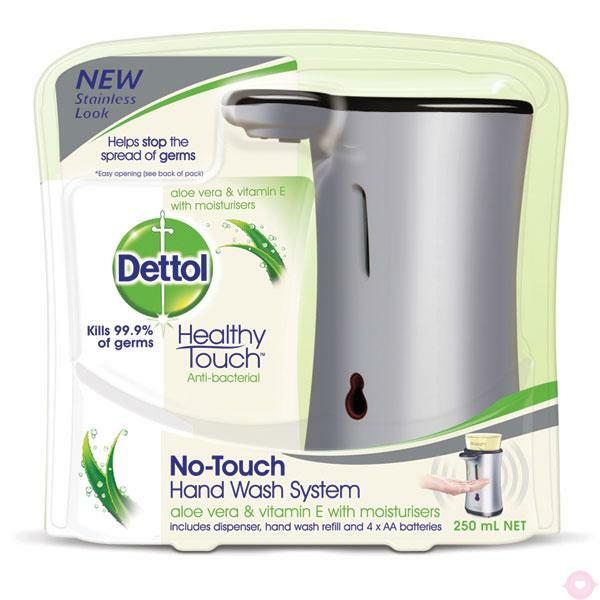 With the Dettol no-touch hand wash system, you don't have to touch the dispenser and the little sensor underneath knows when your hands are under it and dispenses just the right amount of soap (which also saves you from using too much soap and saves you money!). So the benefits are plentiful.